For the past few weeks, the astronomical arcade game, POiSE has been the top pre-app on the PreApps homepage. If you haven’t check it out yet, here’s your chance to learn more! The protagonist of the game, Spike, wrecked his ship on the asteroid belt. 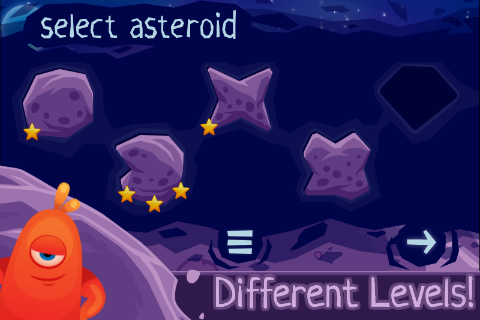 Each level is an asteroid that Spike needs to balance a specified amount of time on to complete the level and move on to the next. The asteroid belt currently holds 30 celestial bodies that range in shape and size. Spike’s spaceship is his key to safety and he can only reach it using a special rescue capsule while he’s fighting his way out of the asteroid belt. POiSE’s graphics, which can be viewed here, look amazing – with bold colors of purple, light blue and royal blue, and of course the vibrant orange of that little guy, Spike! While playing, enjoy the catchy tune of Dead and Alive’s “You Spin Me Round,” with a new electronic beat. The icon is very appealing; Spike’s big smile will definitely draw attraction to iPhone, iPad, and Android users. POiSE’s release date is October 1. Stay tuned for this fun, adventurous game!